Come on down to Slider Town! Forget about food for thought and think about food for drink. Slider Town is a fun, relaxed bar and restaurant serving up some of the best cocktails in Loughborough and a great twist on a tapas concept. 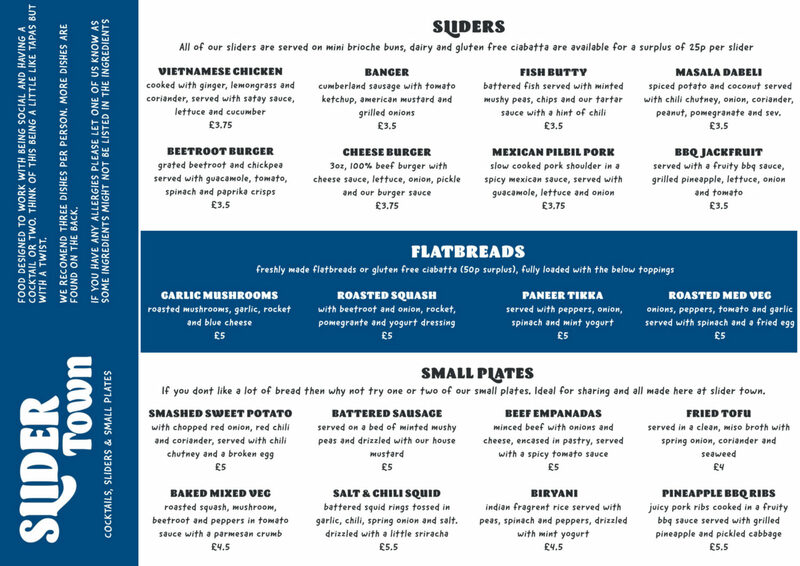 We offer a selection of sliders, small plates, flatbreads, loaded handout chips and nachos. Perfect to share, great for a small bite and even better as a meal out with a little variety. Ok. Let us ask you a question. Have you ever wanted to learn how to make cocktails? Have you done a cocktail masterclass in the past but didn’t think you got your moneys worth? Then why not ask about our cocktail making classes and have an experience tailor made to your wants and needs. Classes start at £25 per person for groups of 4 or more. Whether you are looking for a table, a private space or full exclusive use of the venue we have options for you. For exclusive hires we offer slider canapés; full sized sliders but with no need to queue for your food. 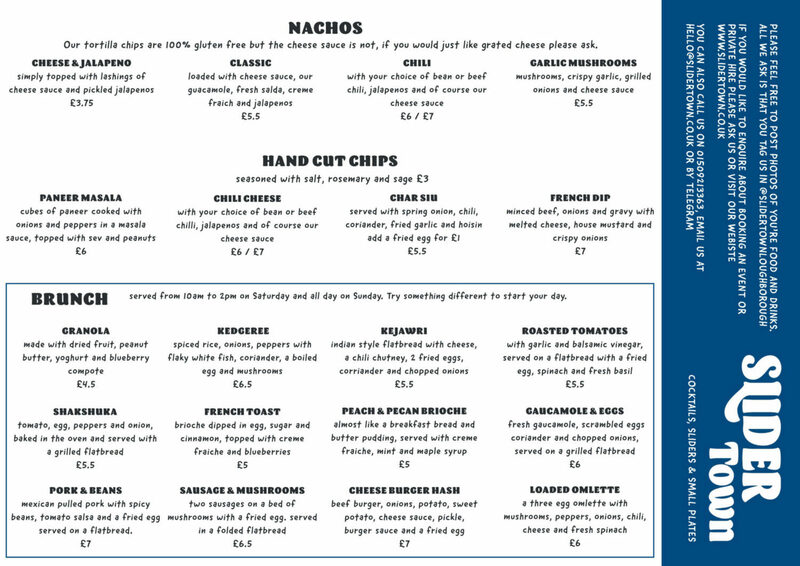 There will be a member of staff walking around with trays of sliders and you take what you fancy. Tortilla chips with guacamole, salsa and jalapeño will be on the tables for your guests to help themselves and each guest will have 3 sliders each. By ticking this box you are happy for Slider Town to contact you regarding offers, news and events.